As Xi prepares to visit Seoul, South Korea is confounded by bad blood with Japan and its government grinding to a halt. South Korea’s latest nominee for prime minister withdrew his candidacy on Tuesday, underscoring several problems the country and its president, Park Geun-hye, are currently facing. The drawn out process to replace Prime Minister Chung Hong-won has stalled other Cabinet nominations, and is affecting the government’s economic policies. With Chinese President Xi Jinping set to visit Seoul early next month, South Korea’s relationship with its neighbors has become increasingly complicated, and the Park government’s current disarray is compounding the problem. Park’s most recent nominee for prime minister, Moon Chang-keuk, stepped down from consideration after being chosen two weeks ago. The opposition, led by New Politics Alliance for Democracy (NPAD), accused Moon of being pro-Japanese, citing a church sermon he gave in 2011 in which he described the Japanese colonial period from 1910-1945 as “God’s will.” According to Yonhap News Agency, Moon said that “following my nomination as prime minister, this nation fell into greater confrontation and division. It worried me that this kind of situation would become a stumbling block to the president’s future running of state affairs.” Park’s original choice to replace Chung, Ahn Dai-hee, withdrew from consideration on May 28 amid questions about money he had made in his private practice, after serving as a Supreme Court justice. Moon’s resignation over statements construed as pro-Japanese highlights South Korea’s current political climate vis-à-vis Japan, whose government recently commissioned an investigation into the 1993 Kono statement, which apologized for the Japanese use of comfort women during the Second World War. While South Korea (and China) vehemently opposed this inquisition into the motives of the Kono apology, South Korea also conducted naval drills off the contested Takeshima/Dokdo Islands last Friday, drawing protests from the Japanese government. It appears that conciliatory statements about Japan can have a significantly negative impact in South Korean politics, which not only inhibits the efficacy of Seoul’s government, but also severely constrains the ability of Japan and South Korea to cooperate. This uncertain position on key economic policies could also hamper negotiations with Xi during his upcoming visit. South Korea’s ambassador to China, Kwon Young-se, said the trip is expected to boost regional and bilateral cooperation, as well as the current negotiations concerning the China-ROK free trade agreement. The 12th round if these talks will also be held at the beginning of next month. 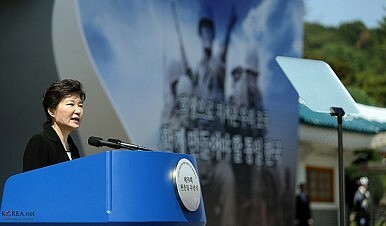 Yonhap also reported that, while Kwon didn’t directly reference North Korea when discussing Xi’s visit, he said “Judging from the current situation, the close cooperation between South Korea and China is especially important, and I believe the two leaders will formulate closer and more open discussion of key issues.” However, with the Park government’s bandwidth significantly curtailed by the holdup in Cabinet appointments and a stagnating economic recovery, the likelihood of a breakthrough on either the FTA or North Korea is limited. Another possible spanner in the works during Xi’s visit, and possibly for the FTA, is a recent survey conducted in South Korea showing that 66.4 percent of people view China as a “military threat,” with only 19.1 percent saying it was not a threat. While these numbers are an improvement over a similar study in 2012, it still shows a widespread distrust among South Korea’s population. The survey further revealed that, of those who viewed China as a danger, 45 percent said it was because of China’s territorial disputes. These types of polling results could be expected to draw Seoul into closer cooperation with Tokyo, were it not for their long-running disputes over territory and Japan’s colonial past. Missteps by both Japan and South Korea have contributed to Seoul’s current situation, in which it finds itself unable to fully take advantage of economic opportunities, and hindered by a relationship that is causing its government to grind to a halt. There will still be opportunities for Seoul when Xi visits early next month, but South Korea will not have the ability to fully take advantage of the situation. China Brings More Economic Retaliation for THAAD Against South KoreaChina Holds Bilateral Talks With South Korea, JapanPark’s US Visit Highlights Balancing Act With China The US-Korea Summit, Take Two: What Park and Obama Should Talk AboutIs China Tilting Toward South Korea?